Stock up on your Marlboroughs and whiskey: True Detective is back. The season three premiere, written by series creator Nic Pizzolatto and shot by Green Room director Jeremy Saulnier, doesn’t exactly reinvent the wheel, but it boasts solid writing and a standout performance from Mahershali Ali. Great shows are always about great casting. Whether it was Mathew McConaughey in season one or Colin Farrell and Rachel McAdams in season two, True Detective matches character and actor with laser-sharp precision. They may as well give Mahershala Ali his Emmy now; his casting has reinvigorated the series after last season descended into self-parody. He plays Arkansas detective Wayne Hays with a mixture of sensitivity and self-loathing, using his authoritative physical presence to lend the show’s run-of-the-mill premise with extraordinary gravitas. Fresh off an Oscar win for Moonlight and a potential follow up for Green Book, Ali may be the most exciting actor working today. If he and the rest of the season are this smartly assured, it could be another installment for the ages. Like season one, season three’s premiere uses a framing device. Two, actually — one in 1990, where a murder case has been re-opened, and one in 2015, where he gives interviews for what looks like a true crime series, which cleverly speaks to today’s current obsession with authentic crime stories. Using expressive close ups, an infinite sense of regret lies upon Ali’s face as he reluctantly goes back over the details. The brilliant Ali is able to convey so much with just his eyes alone, compelling the audience to join him as he explains his version of what happened to those two poor kids. Cut back to 1980, where’s he’s hanging out, smoking cigarettes, drinking beer, and shooting cans with his partner, Roland West (Stephen Dorff). West suggests a whorehouse; Hays declines. They’re bored and single, waiting for something to happen. It’s November 7, the day Steve McQueen died, and the scene is played to signify the death of traditional, tough-guy masculinity. Hays suggests that they take a drive, and they receive a radio request to search for two missing children. In a nice touch, they both take breath mints before entering the house. A Vietnam veteran who was airlifted alone into the jungle for reconnaissance, Hays has a First Blood-vibe about him. He is haunted by the war, but it has also prepared him for the worst. A typical loner, he tracks and hunts wild boar for fun. Out in the woods, he diverts from the volunteers and police officers scanning the ground, picking up on his own trail. 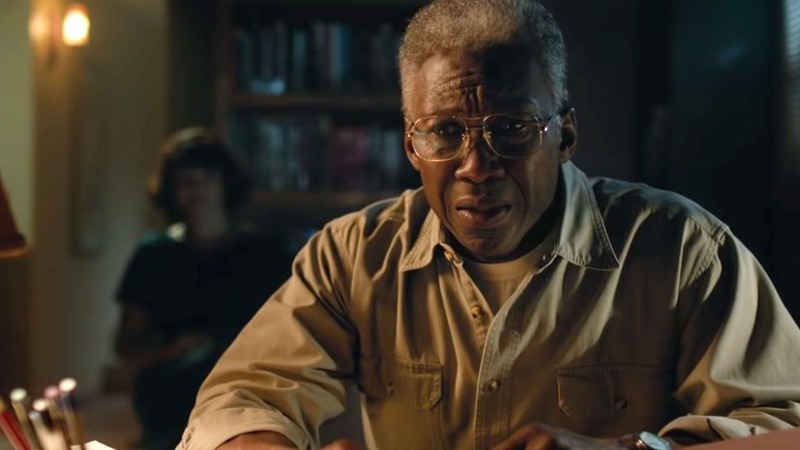 True Detective wants you to pay attention, to meticulously follow the trail like Hays, even if the clues it gives could be red herrings. There are the missing bicycles, the boys drinking in the park, the man who drives a buggy and picks up trash, the stack of Playboys under the missing boy’s bed, and most disturbingly, there’s the eyehole carved in his wardrobe that looks into his sister’s room. Any one of these clues could be vital, or they could be leading us down the rabbit hole. This is what makes the show so compelling, as it’s always been about the search for meaning in a seemingly meaningless world. What can we even trust in such a cruel universe? The universal fight between light and darkness continues, the Ozarks perpetually draped in an enigmatic fog. It’s a poor area, there’s nothing to do, secrets linger; this dread-filled vibe makes for compelling TV. The mood-soaked, depression-laden series that reinvented the anthology form is easily one of the most influential shows on TV. It was all over Sharp Objects last year, which also trucked in missing children, repressed secrets, and nihilism. While Netflix may have cornered everyone’s eyeballs with its infinite content strategy, HBO is still the channel making truly event TV. Remember the hype for season two, which nearly everyone considered a massive disappointment? It was easily the most ambitious, weaving three characters together into a plot that only the most rigorous detectives could make sense of. It lost its way considerably. Season three, somewhat less anticipated in today’s oversaturated era, brings things back to basics: two missing children, two depressed detectives, and a love interest in the form of a wholesome English teacher. Played by Carmen Ejogo, it’s evident that she will be the light to Hays’ darkness. With the exception of McAdams in season two, True Detective has always had a woman problem, either treating them as hopeless wives or prostitutes. Hopefully the Alien: Covenant star is given more to do here, potentially making season three the richest one yet. This is a great start.